Wake up the party with these fun and unique Sleeping Beauty birthday ideas! Make everyone at the party feel like a princess by using these ideas for invitations, decorations, games, food, favors, activities and much more! Look for a favorite idea of ours ... a Blessings jar from Flora, Fauna and Merryweather. Let the party guests bless the birthday girl and have a keepsake that will last forever. See below for details. There is even a special Treasure Hunt to look for Prince Phillips kiss ... Hershey's kisses that is! Buy or make small pillows and write party information on them with a permanent marker. Solid color pink note cards with a yellow or dark pink bow hot glued to the front. Make invitations out of pink cardstock that look like a sleeping mask. Print party information on white paper and cut to fit inside the sleep mask with about 1/2" difference all the way around so that the pink cardstock shows in the background. Cut the edges with scrapbook scissors. 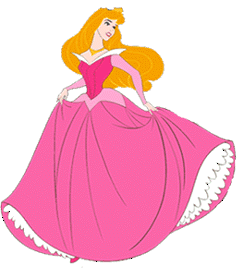 Sleeping Beauty's colors are light pink, dark pink and white - use these colors throughout the party area. Use pink tablecloths with dark pink table runners on the party tables. Party chairs can be given a royal treatment by wrapping light and dark pink tulle around the backs of them and then tying in a big bow. Use tiaras as name tag holders at the table. Or you can make tall cone shaped princess hats from cardboard and attach tulle to the top of them. Tulle is cheap and makes a party room feel extra special. Starting in the middle of the room drape yards of tulle from the center outward to the four corners of the room. Let the tulle cascade down the walls. Command strips are an easy way to hang the tulle and easy to take down after the party. Simply slip the tulle through a rubber band or tie with ribbon and set the rubber band on the command hooks - hide by puffing the tulle around the command hook. Flora, Fauna and Merryweather all gave Sleeping Beauty birthday blessings. Let your guests do the same for your sleeping beauty by setting out small pieces of paper and having them write a note, verse or blessing to her. Save them and read them aloud at the end of the party or when she is opening up presents. Save them in a jar, picture frame or scrapbook page so they will continue to bless her throughout the year. Let the party guests decorate their own pillowcase with fabric paints and/ or permanent markers. Set out markers and stencils of crowns, fairy wands, castles, etc. and let them free style paint or trace around the stencils. A bounce house is always a great birthday party idea. Choose one that looks like a castle to fit in with the Sleeping Beauty party theme. Create a fun treasure hunt for the girls and have the clues lead to Prince Phillips kiss (box of Hersheys' kisses!). Create a story about Flora, Fauna and Merryweather searching for the kiss that will wake Sleeping Beauty. Tell the children that the fairies have left clues to where to find the kisses. Lead the princesses through the house with different clues until the last clue leads them to the treasure. You can also have them complete tasks or play games along the way of the treasure hunt to make it last longer. At a few of the clue stations have items like rings, play high heels and tiaras waiting for them so they can wear them along the treasure hunt route. Play this game just like freeze tag except when the players are tagged they have to lay down and pretend they are sleeping. Choose a player to be "it" and call her Maleficent. Maleficent tries to tag the other players. When she tags a player then that player must fall to the ground and pretend to be asleep. Players who are not asleep can tag the asleep players and wake them up. When all the players are asleep then another Maleficent is chosen. Marshmallow pillows - dip large marshmallows in water and then roll in pink and white sugar crystals. Place each on a skewer and set into a decorated vase or jar.